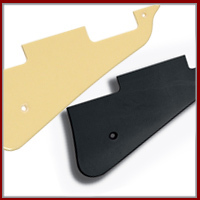 Pickguard for Les Paul®, Black 3-ply (B / W / B). Top neck pickup spacing is 45.5mm. Screw hole spac.. Please note that this pickguard will only fit genuine Gibson® Les Paul® Standard or Les Paul® Custom..